After a little snack at The Island Cafe and some more chillaxing at the beach at Ward’s Island, Ipana had a fantastic suggestion of going to Sukhothai for dinner. Apparently it is comparable to the popular Khao San Road Thai restaurant that is on Adelaide Street. As a foodie, I just had to try it out and was very happy to know that it was open on a holiday Monday (Victoria Day). 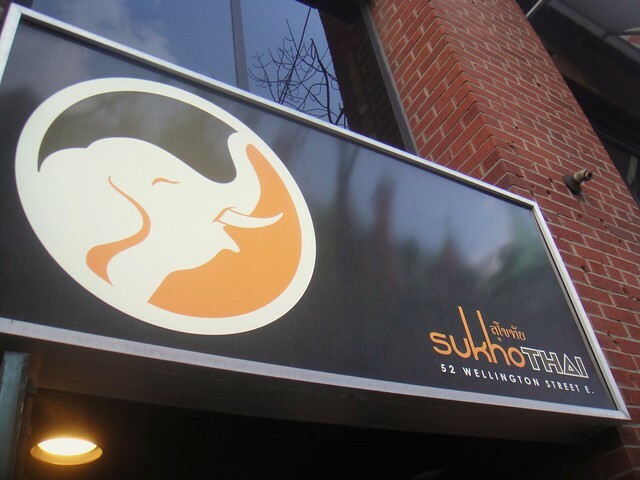 Sukhothai is located on Wellington Street and close to Union Station. It is dimly lit inside and decorated nicely with sculptures and paintings that remind you of Thailand. The menu was a little more limited that I expected but whenever that happens, it’s also a good thing because you can make your choices relatively easily. We were a table of 6 and the server catered to us well by asking if we wanted to order any drinks or appetizers to start. 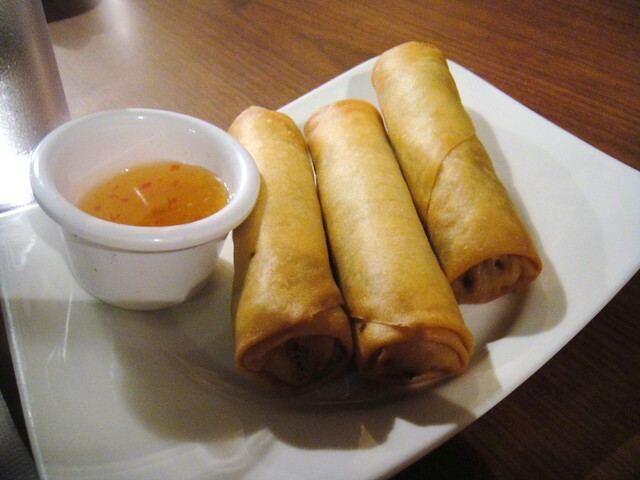 We shared the Crispy Spring Rolls which I thought were very average and nothing out of the ordinary. 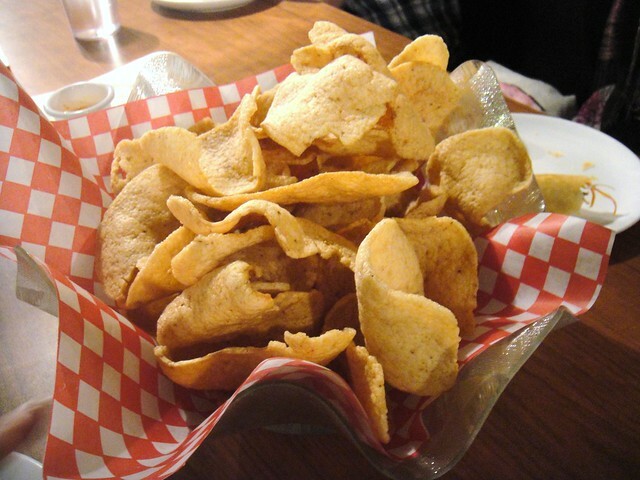 We also shared a bowl of Shrimp Chips that came with a strong tamarind dip. The chips had a real shrimp flavour and were large and crunchy! Most of our party skipped the tamarind dip and ate the chips plain since its tamarind flavour was too intense, but I quite enjoyed it since it was unique. 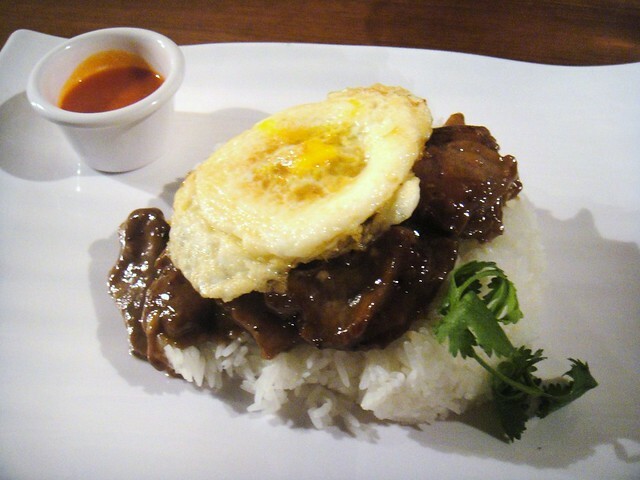 I ordered the Nua Gra Teaum which was stir-fried garlic beef with fried egg and jasmine rice. I felt like having some meat and rice on this evening, so this dish fit the bill perfectly. The dish came with a little portion of hot sauce which complimented the stir-fried beef and jasmine rice very well. You could adjust how much spice you wanted in your rice after you mashed up the fried egg and beef together. The stir-fried beef was pretty good, not rough or chewy, but I didn’t taste much “garlic” in the garlic beef. I liked the gooey fried egg that I burst open on top of the bed of rice. The jasmine rice was also very well cooked — it was soft and a good texture. The portion was quite generous for one person depending on how hungry you were. 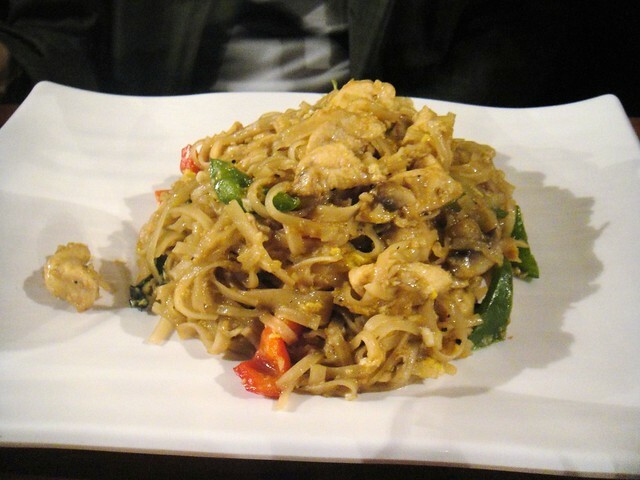 Tim ordered a dish similar to the pad thai, which I believe was the Pad Kee Mao. I tried a bite and I really, really liked it. Its flavouring was at a good level; not too strong or too weak. If I wasn’t craving for a rice dish, this dish would have been a terrific pick! I didn’t get to try any of their desserts although I was curious about the Cassava Cake. Maybe next time! How does Sukhothai compare with Khao San Road? I think they both have their merits since both restaurants serve good-quality Thai food. However, Khao San Road remains the more popular restaurant with no reservations allowed and also never-ending wait lines. This entry was posted in Food and tagged @SukhoThaifood, downtown, food blog, foodie, fried egg, jasmine rice, Nua Gra Teaum, Pad Kee Mao, restaurant review, shrimp chips, spring rolls, stir-fried garlic beef, Sukho Thai, Sukhothai, Thai food, Toronto, Wellington. Bookmark the permalink.